These fruit roll ups are nutritious snacks that kids will happily eat. They love to play with their food. They turn their noses up at anything labeled ‘nutritious’. If you want to conquer #2, you have to embrace #1. We know that Ambrosia apples are super healthy and that many kids don’t need to be coaxed to eat them but if you want to see your kids eat more apples, you might try fun fruit leather. It’s surprisingly simple. We found this great recipe from Real Mom Nutrition and we loved it. Of course we used Ambrosia apples which are pretty sweet on their own, so we only had to use 1 tablespoon of sugar. And, because we love variety, we tried a few recipe variations that we highly recommend you test out too. Mixed Fruit. We replaced one cup of Ambrosia apples with a cup of raspberries. We drained some of the liquid because it came out a bit runny once blended. We love the raspberry-apple combination but you really could try this with pretty much any other fruit – blueberries, cherries, peaches, cranberries… so many potential combinations! Ginger. If you’ve seen our recipe for warm apple cider, you already know we’re fans of spicing things up. We added a teaspoon of ginger powder (you could also use fresh, minced ginger) and a squirt of lemon to take our Ambrosia apple leather up a notch. Delicious. Maple. Okay, we’ll confess – this was a total experiment but it worked! We replaced the regular sugar with maple sugar and the results were amazing. It provided a subtle flavour shift that made the snack feel a bit more decadent. That got us wondering what other natural sweeteners would be worth a try – maybe coconut sugar, agave, dates or Demerara? 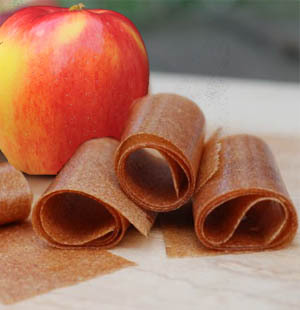 What would you do to make this Ambrosia apple fruit leather recipe your own? We’d love to hear your yummy ideas – share them with us using the social media buttons below.